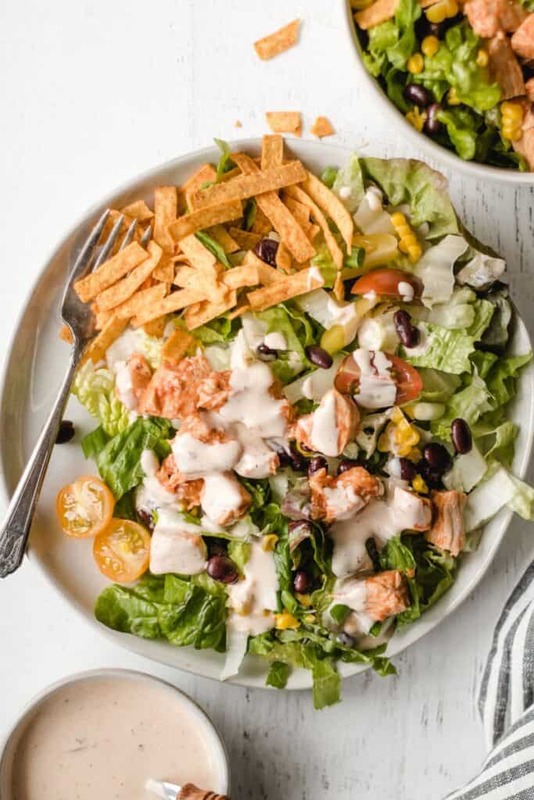 Southwest BBQ Chicken Salad with crisp romaine, black beans, and sweet corn. Topped with a spicy chipotle Ranch Dressing. Make the famous Portillo’s salad at home! If you live in the Chicagoland area, you’ve probably been to a Portillo’s. 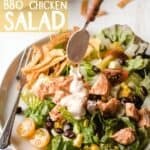 Southwest BBQ Chicken Salad is one of their signature salads. Actually, I think it’s been renamed to Chipotle Barbecue Chicken Salad but it’s basically the same salad. Since going gluten-free we don’t eat at Portillo’s anymore, but that doesn’t stop me from making one of their signature salads at home. 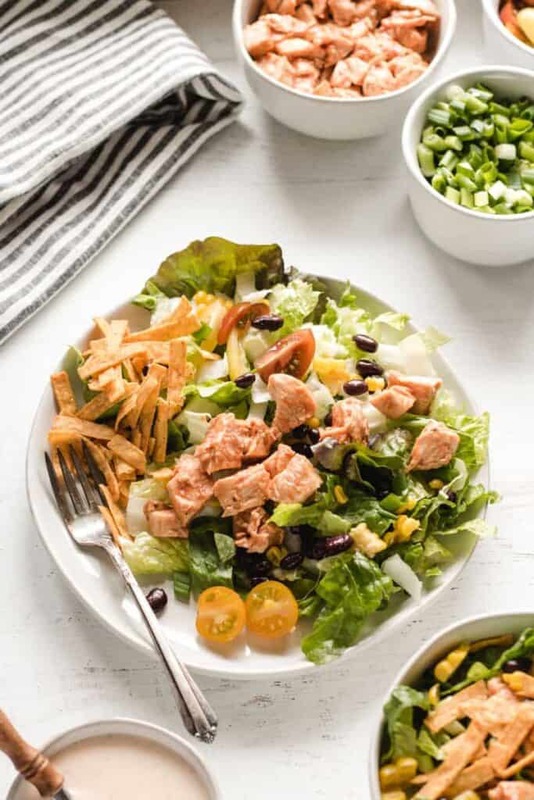 This salad is a family favorite! Whenever we used to get this salad, I always thought to myself, I can surely make this at home. 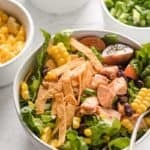 Southwest Barbecue Chicken Salad has become a family favorite. Whenever someone requests salad in my house it’s probably this salad or Buffalo Chicken Salad that they ask for. This vinaigrette is also at the top of our favorites list! Bbq chicken: Bake chicken breast, dice it, and then toss it in your favorite barbecue sauce. Corn: either fresh from the cob, canned, or thawed from frozen. Canned black beans: rinsed and drained. Cheddar cheese if you like cheese! 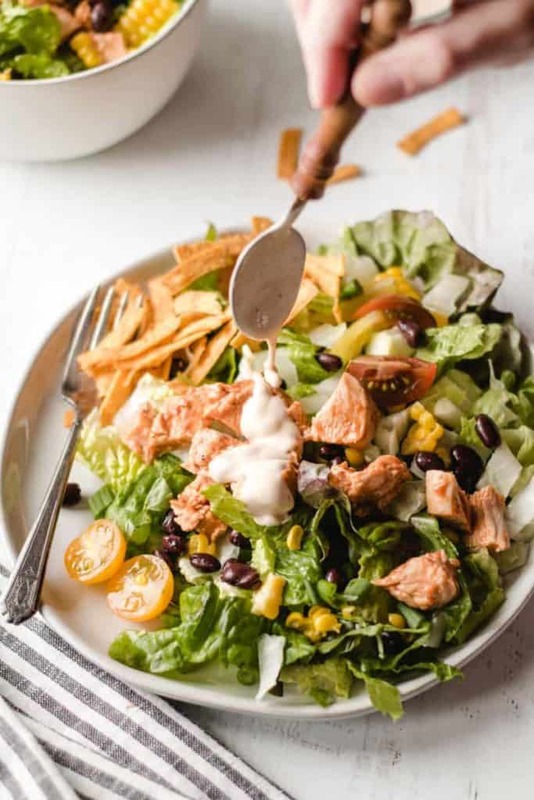 Chipotle Ranch Dressing: make this by mixing a little sauce from a can of chipotle peppers in adobo with your favorite ranch dressing. This salad is all about layers of crunch and flavor! Spicy, zippy ranch, sweet bbq chicken and corn, and zesty green onions! All topped with those crunchy tortilla strips. It’s hard to pick a favorite part! That’s what makes this salad so yummy! 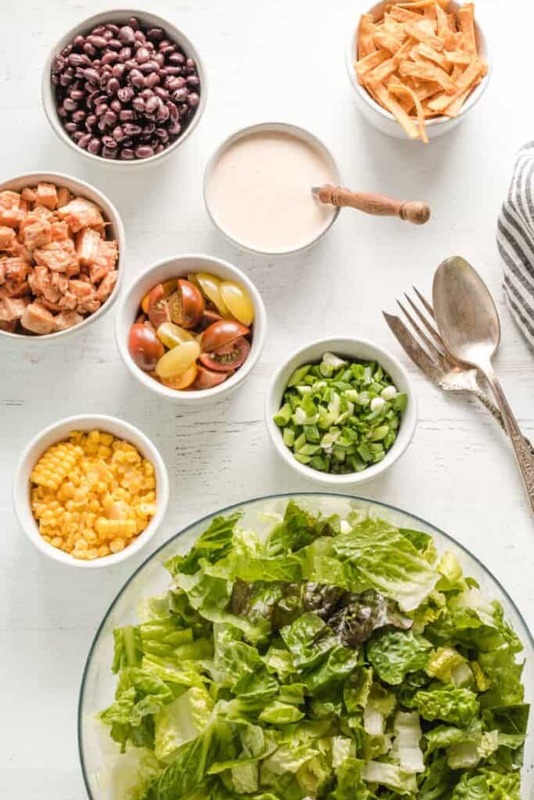 The best thing about salads, especially for family dinners, is that everyone gets what they want. I chop up all the salad ingredients, put everything out in bowls, and then let everyone build their own salad. The leftovers make a perfect lunch! Do you ever try to make your favorite restaurant salads at home? Let me know what you’ve made down below in the comments! Mix together the ranch dressing and adobo sauce. Start with 1 teaspoon of adobo sauce, taste and as more as desired. Toss the diced chicken with barbecue sauce. Prep remaining ingredients and set aside in bowls. To make the salads, layer lettuce, black beans, corn, green onions, tomatoes, cheddar cheese, and chicken. Top with dressing and add an extra drizzle of bbq sauce, if desired. Top with tortilla strips and enjoy! This salad looks great! Perfect summer meal. And a nice winter treat to remind me of summer. I’ll be adding these ingredients to my grocery list! !